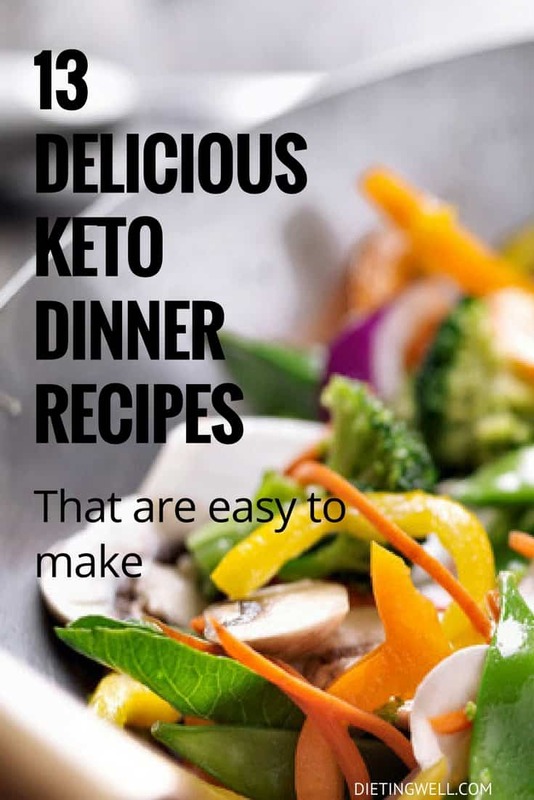 Eating in a ketosis friendly way doesn’t mean that you have to actually starve; there are delicious recipes that you can eat that won’t even feel like diet food. Here are 13 keto friendly dinner recipes that are both healthy and delicious. This is an absolute winner, especially if you’re looking for a Chic-fil-A style chicken dinner that isn’t quite as packed with carbs as the chicken available at the fast food chain. Another great aspect of this recipe is the fact that it uses leftover pickle brine, which is actually a very healthy liquid that is packed with electrolytes and nutrients. Cooking Time: This will take 30 minutes of cooking and a full day of brining the chicken. 1) After grabbing a large freezer bag, set it upright and pour the pickle juice (brine) inside. After all of the brine is in the bag, place the chicken breasts inside and seal. Set the brine marinating chicken inside your fridge for at least eight hours, though a full 24 hours is recommended. 2) Remove the Chicken from the bag and slice it to whatever size you prefer. 3) Place your beaten eggs and the rinds into two separate bowls. 4) Try your best to drain the chicken of any excess brine. 5) Dip the chicken first into the egg wash and then into the ground rinds. 6) Heat up your peanut oil in a large frying pan. 7) Place your pork rind battered chicken into the oil and cook on both sides until they are golden brown. This usually takes around three minutes on each side of the cutlets. This recipe has about 244 calories. There is about six grams of fat per breast. With low carb brine, this recipe has about six grams of carbs. Each chicken breast has about 37 grams of protein. Chorizo Meatballs are great as a low carb dish. Instead of using bread or traditional taco shells to hold the meatballs, you can simply use a leaf of lettuce to create a vehicle to serve the meatballs in. If you are not a big fan of spicy food, then you can substitute the chorizo for whatever type of sausage you may prefer. 1) Combine all of the ingredients into a bowl, except the oil, and form the mixture into ½ inch meatballs. 2) Heat oil in a skillet, and cook the meatballs until they are brown. This should take about three minutes for each side. 3) Drain the meatballs and place them on a lettuce or cabbage leaf to enjoy. Red cabbage is particularly tasty in this recipe, and it will add additional nutrition to the dish. 4) Before you take a bit, make sure to garnish these taco-style meatballs with chopped red and green peppers, onions, tomatoes, cilantro, and a sour cream based sauce. Each meatball is 87 calories. There are six grams of fat per chorizo meatball. Each one contains 0.4 grams of net carbs. A meatball contains seven grams of protein. This is also a great first meal of the day option as well as a staunch choice for dinner. What makes frittatas so great is how fast and easy they are to microwave when you want to have leftovers. This recipe blends the dinner friendliness of the pizza with the ketogenic goodness that comes from eggs. Some think this pizza frittata is somewhat like a quiche, and they aren’t exactly wrong. In any situation, this is a great meal for someone looking for something interesting for dinner that isn’t packed with carbohydrates. Quantity: This recipe yields eight pizza slice servings. Cooking Time: About 30 minutes with a cast iron pan, 40 with a Pyrex-style glass dish. 1) Defrost your frozen spinach in the microwave; making sure there is little excess moisture. 2) In a large bowl, mix the dozen eggs with the salt, pepper, nutmeg, and oil until it’s thoroughly scrambled. 3) Combine this mixture with the ricotta and spinach, and then blend once more so that everything is evenly distributed. 4) Pour this semi-thick mixture into your skillet or baking dish and top with the mozzarella. 5) Pull the defrosted breakfast sausage apart and disperse evenly over the surface of the egg mixture. 6) Bake for a half an hour with the skillet; 40 minutes or so with a baking dish. 7) Serve in slices like a pizza. • This recipe has about 298 calories per serving. • There is about 24 grams of fat per slice. • This recipe has about two grams of net carbs. • Each slice of frittata has about 19 grams of protein. This is a great fish taco for anyone who likes a bit of spice. It is served in a low carb tortilla shell, but that can be cut out all together if you want to enjoy the dish wrapped in lettuce leaves instead. 1) In a large skillet, fry the onion in the olive oil over medium high heat until they are slightly translucent. This process should take about five minutes. 2) Turn the heat down to medium and add the jalapeno and garlic, and then simmer the ingredients for two or three additional minutes. 3) Add the chipotles, the adobo sauce, the butter, the mayonnaise, and the fish to the pan. 4) Combine all of the ingredients and cook them for about eight minutes; until the fish is cooked completely. 5) Place the filling into the shell that you are using for the dish and enjoy. Don’t forget to include toppings like lime, green onions, red peppers, or sour cream. 6) If you do not enjoy spicy foods, then skip the jalapeno and the chipotle in favor of some lime juice and cilantro. Each taco is about 300 calories; depending on the toppings that you include. There are 20 grams of fat in each; this is based on only the taco filling. There are seven grams of net carbs per taco. One fish taco has 24 grams of protein. Nothing beats a spicy soup when the weather is getting cold. You’re warmed by the heat from the soup and heated by the spice. This buffalo soup goes into the Crockpot for several hours before its ready, so it’s the perfect keto-friendly meal that you can prepare over the course of a day. Before serving, you can also emulsify the liquid if you want a more consistent texture that experiences less separation. Cooking Time: Six hours on low, three on high. 1) Slice up your chicken breast and place it in the bottom of your Crockpot. 2) Mix the onion and garlic powder, the butter, the celery seed, hot sauce, broth, xanthan gum, and the salt and pepper in a large bowl and pour into the Crockpot as well. 3) Cook the ingredients for six hours on low or three hours on high. 4) Carefully remove the chicken from the mixture and pull it apart gently with a fork. 5) Place the shredded chicken back into the pot. 6) Place the remainder of the ingredients into the Crockpot. 7) Serve in a large bowl. This recipe has about 523 calories per serving. There is about 42.5 grams of fat per bowl. This recipe has about three grams of net carbs. Each bowl has about 20 grams of protein. This taste combines a deliciously spicy flavor that’s a favorite at Chinese restaurants around the country with a healthy low carbohydrate ketosis-friendly composition. This is a very authentic tasting dish that will take some skill to create, but no one will know the difference between this and traditional kung pao chicken. Quantity: This recipe makes three servings. 1) Cut up and debone your chicken so that it forms bite-sized morsels. 2) Season the freshly cut chicken with the ginger, salt, and pepper. 3) Fill a large pan with oil so that the chicken will be covered and cook chicken in the oil for ten minutes. 4) Once browned, place the cooked chicken on a paper towel to drain. 5) Combine all of the ingredients for the sauce and mix so that it’s smooth. 6) Chop up the remaining vegetables. 7) Place the chicken and the veggies back in the pan and simmer until everything is cooked down and the veggies are semi-translucent. 8) Add the sauce, and let it cook down until it evenly coats the chicken and veggies. This recipe has about 362 calories per serving. There is about 27.4 grams of fat per serving. Each serving of chicken has about 22 grams of protein. Quiche is a deliciously cheesy pie that is filled with eggs, ham, sausage, or whatever meat you choose to put into the dish. This recipe does not call for a particular meat, but if you want to add something into the dish, sausage, bacon, or ham are perfect in this pie. 1) The quiche will be baked, so begin by preheating the oven to 350 degrees. 2) Sauté the onion and any other vegetables that you wish to add into the pie in the butter until the onions are translucent. 3) In a fairly large bowl combine the eggs with the cream and spices. The result should be a bit frothy. 4) Butter or grease a quiche pan, and then layer a cup of each type of cheese on the bottom of a pan. 5) Once the vegetables and any meat that you are adding to the pies are cool, you can place them on the cheese that is inside the quiche pans. 6) Pour approximately half of the egg mixture into each of the pie pans. 7) Bake for about 25 minutes. It will be cooked when the eggs have set and the middle is a slight golden coloration. As a rule of thumb, if you insert a knife into the quiche and it comes out clean; it is done. 1/6th of the pie is about 382 calories. Each slice has 33 grams of fat. There is only five grams of carbs in each slice. 15 grams of protein is found in a serving of this quiche. This new classic blends the reliable sweetness of the griddle cake with the savory flavor of sausage. While for many this can serve as a great breakfast meal, it can also be an excellent dinner that is keto faithful. Sage sausage is best for this dish as it meshes well with the sweetness of the griddle cake breading. 1) Remove the skins from the sausage links and make the sausage meat into small morsels. 2) Preheat your oven at 350 degrees Fahrenheit. 3) Over medium heat, cook the sausage morsels until they are cooked through and browned. 4) In a large bowl, mix all of the dry ingredients with the wet, save for the low carb syrup. With the syrup, only measure out about four tablespoons. Mix it all together. 5) Grate the cheese and add the shredded results into the mixture. 6) Add the browned and ready sausage to the combination of the other ingredients; ensuring that you drain away any excess oil. 7) Pour the mixture into a casserole dish that’s been lined with parchment paper. You can drizzle the extra syrup (two tablespoons) with salt and pepper over the top of the mixture now. 8) Bake for 45 minutes at 350 degrees Fahrenheit. 9) Lift the parchment paper and serve. This recipe has about 483 calories per serving. There is about 42 grams of fat per serving. Each serving of the casserole has about 22 grams of protein. This recipe is a great dinner meal that calls for you to use a spiralizer. Spiralizers are vegetable slicers that spiral cut vegetables into delicious homegrown pasta. Some of the best veggies to use with a spiralizer are gourds like squash, pumpkin, or zucchini, but there are plenty of vegetable options to spiralize. This recipe calls for zucchini pasta, so you won’t have to worry about the heavy carbohydrate content of standard pasta noodles. Quantity: This recipe makes two servings. 1) Start by spiralizing your zucchini into long noodles. 2) In a large pan, heat the olive oil until it’s hot. 3) Throw in the mushrooms and fry them; ensuring that they soak up the oil. 4) Once they’ve soaked and fried, add the butter and cook until the mushrooms are browned. 5) Add in the shrimp and cook them thoroughly on each side; three or four minutes on each should do the job. 6) Throw in your spiralized zucchini noodles and cook for two whole minutes so that the noodles soak up the flavor. 7) Add in the remainder of the ingredients and finish with a sprinkle of grated parmesan cheese and serve. This recipe has about 440 calories per serving. There is about 28 grams of fat per serving. This recipe has about seven and a half grams of net carbs. Each serving of the pasta dish has about 39 grams of protein. Tuna is a great low-carb, keto-friendly fish that is great in a wide variety of dishes. This dish serves four and uses the tuna in its raw form to provide a very delicious tasting bowl of seafood, veggies, and rice. As a matter of fact, there is not much cooking in this dish at all. Quantity: This dish provides a full four servings. Cooking Time: While you don’t cook any of the ingredients save for the rice, it’ll take more than an hour of overall preparation due to the marination. 1) The rice part of this dish is actually cauliflower. You’ll need to pulse some cauliflower into rice-sized pieces. This takes practice; be sure not to over-pulse it too fine. 2) Once pulsed, heat the rice in a large frying pan at medium for about five minutes. 3) Cube your fresh ahi and add the chunks into a bowl. 4) Pour the soy sauce and sesame oil into the bowl. 5) Marinate the ahi in the oil/soy mixture for about an hour in the fridge. 6) Peel your avocados, slice them in half, and remove the cores. Then cube the sliced avocado so that it’s about the same size as the tuna chunks. Then, add in the edamame and your cauliflower “rice”. 7) Add the remaining veggies to the bowl. 8) Finally, add in your tuna and the sarayo to taste. Mix well and serve immediately in a bowl. This recipe has about 340 calories per serving. There is about 23 grams of fat per serving. This recipe has about one gram of net carbs. Each serving of the casserole has about 27 grams of protein. This recipe is another foray into south of the border cooking. You’ll be making your own guacamole this time; a mixture that is low in carbs and tastes perfect. Since this Mexican meal takes a few extra steps for the full meal, it’s not the easiest to make. Once you’ve done all the steps though, you’ll love the how this keto-friendly dish tastes like authentic Mexican food. Quantity: You’ll have a full four servings using the measurements we’ve outlined below. Cooking Time: From start to finish you’ll need to set aside 40 minutes. 1) Slice, peel, and de-pit the avocado and cut it into chunks. 2) Chop up the onion and cilantro into very fine pieces. 3) Mash together the vegetable ingredients and the salt and pepper together in a bowl to make fresh guacamole. Set it aside. 4) In a medium pan, brown the ground beef evenly until it is crumbles. Drain all excess grease. 5) Add the taco seasoning and the ½ cup of water to the pan, and then stir until the meat is properly proliferated. Cook this for another ten minutes so that the flavor mixes in. 6) Transfer the seasoned meat to bowls; split evenly for four servings. 7) Layer the remaining ingredients, guac, meat, lettuce, meat, and so on, and then top with the sour cream to create a delicious meal. This recipe has about 421 calories per serving. There is about 24 grams of fat per serving. Each bowl has about 11 grams of protein. This recipe combines a classic lunch or dinner favorite with a decidedly breakfast-style ingredient. The result is a delicious anytime meal that is perfect for when you’re having a night in and want to enjoy a little barbeque flavor combined with the smokiness of bacon. This is another recipe where an immersion blender is needed. Quantity: This recipe will make four BBQ bacon cheeseburger waffles, at about a serving each. Cooking Time: It’ll take about a half hour of preparation. 1) Place 1.5 ounces of the cheddar cheese into a bowl. Mix in the parmesan, eggs, the almond flour, and salt and pepper. This is your waffle mixture. Set aside. 2) Heat the bacon over medium heat until it’s soft but not crispy. Toss in the beef and cook until both are well done. 3) Drain the meat, but save the grease for your waffle mixture. 4) Immersion blend the grease into the mixture. After fully blended, place the waffle mix into a waffle iron and make waffles four waffles. 5) Mix the ¼ cup of low-carb, sugar free barbecue sauce into the cooked meat. 6) Top each prepared waffle with the meat mixture and top with the remaining cheddar cheese. Serve immediately if the cheese melts, or for a browned crust, broil for a minute or so, then serve. This recipe has about 354 calories per serving. There is about 30 grams of fat per serving. Each topped waffle has about 19 grams of protein. This recipe calls for some more of the cauliflower “rice” that we used for the tuna recipe. Rice is too high in carbohydrates to be good for a ketogenic diet, so many dieters substitute it will either ketogenic-friendly noodle rice or simply use cauliflower to simulate the taste. This spin on a traditional Japanese classic has a lot of flavor and is relatively easy to make; it’s another dish that requires almost no cooking. This dish uses Ahi tuna for an exceptional sushi flavor. You’ll also need a sushi roller for this recipe. Quantity: Four or five rolls. A serving is about one and a half rolls. Cooking Time: This should take 20 minutes to prepare. 1) Once again, the rice part of this dish is made of pulsed cauliflower. You’ll need to pulse some cauliflower into rice-sized pieces. Be sure not to over-pulse the cauliflower so that it’s not too fine. 2) Once pulsed, heat the rice in a large frying pan with the soy sauce at medium for about five minutes. 3) Allow the rice to dry. 4) While the rice is drying, slice your cucumber down the middle and then slice into long, thin strips. 5) Slice the tuna into strips. When you combine, you’ll have to use several pieces of the fish. 6) Mix the rice with the cream cheese and the rice vinegar in a bowl. Once it’s mixed, allow to cool in the fridge for ten minutes or so. 7) Slice the avocado into strips, similarly to the cucumber. 8) Coat your sushi roller in saran wrap and then place your nori onto it. Spread 1/5 of the cauliflower rice onto it and add the veggies and the tuna. 9) Roll lightly and serve. This recipe has about 353 calories per serving. There is about 26 grams of fat per serving. This recipe has about six grams of net carbs. Each roll has about 18 grams of protein. For more details and recipes, you can’t go past The Keto Guidebook. Click here to take a look . Fantastic recipes for someone who has been on the program for four months. getting very bored.